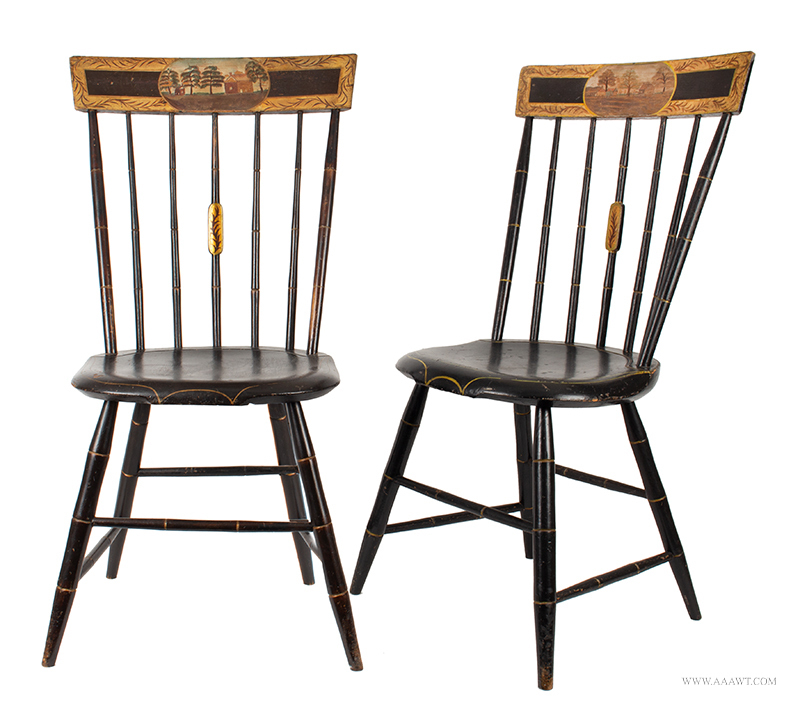 Pair of bowback Windsor side chairs displaying original surface history; nearly full coverage brick red over what appears to be original green paint oxidized to near-black. 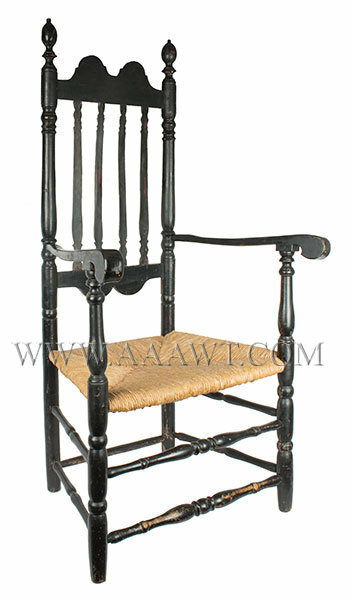 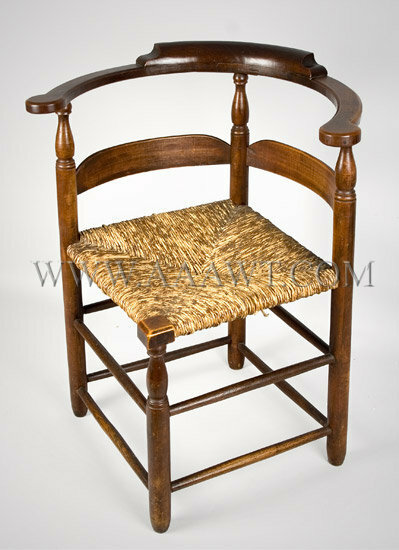 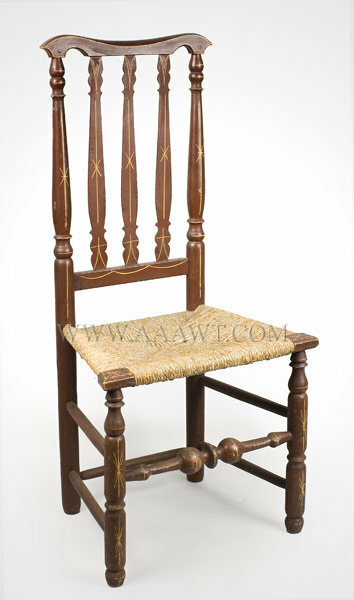 Nine bamboo turned spindles featuring robust nodules that pierce the reeded bow and under-cut saddle seat with incised gutter; the bamboo turned legs pierce the seat and are joined by exceedingly rare yoke-form stretcher. 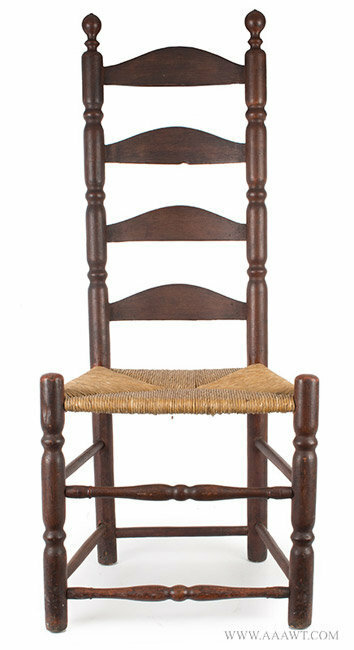 These chairs just arrived, please call for full description, and/or enthusiastic discussion. 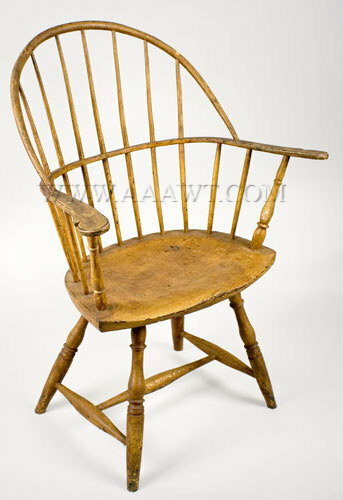 A robust armchair of generous proportion; the seat and surface have been refreshed; very old blacksmith repair to one arm with all else fine. 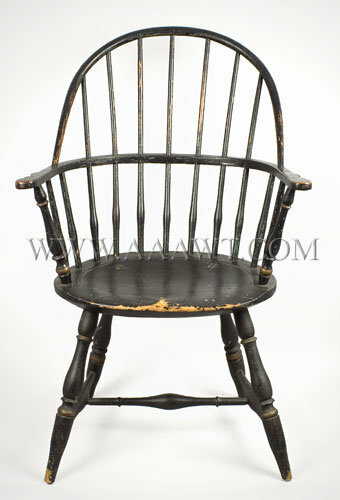 Old black over red paint. 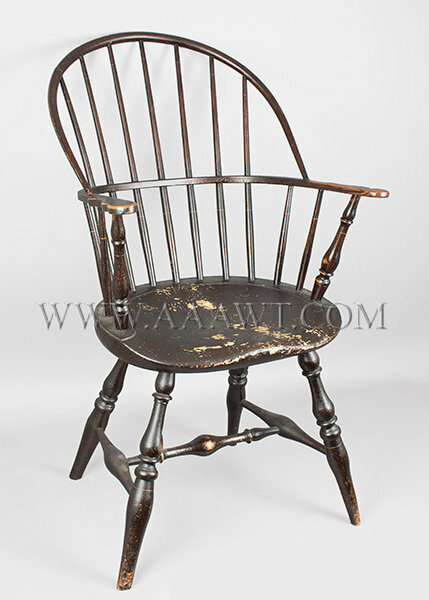 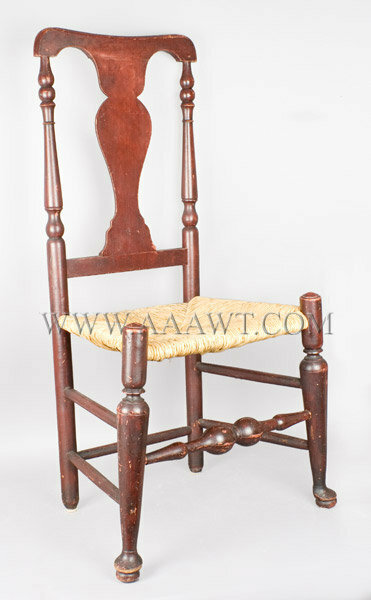 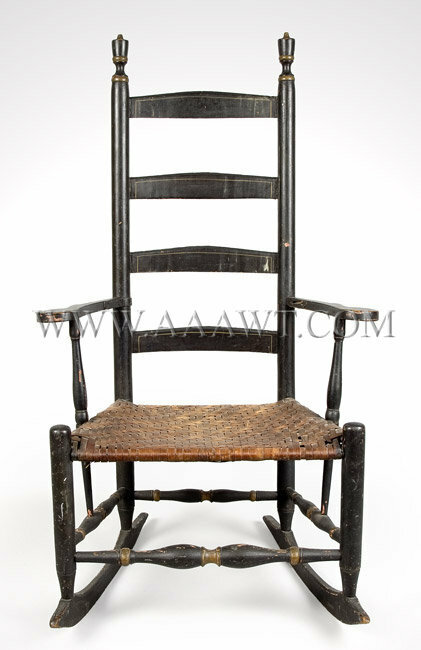 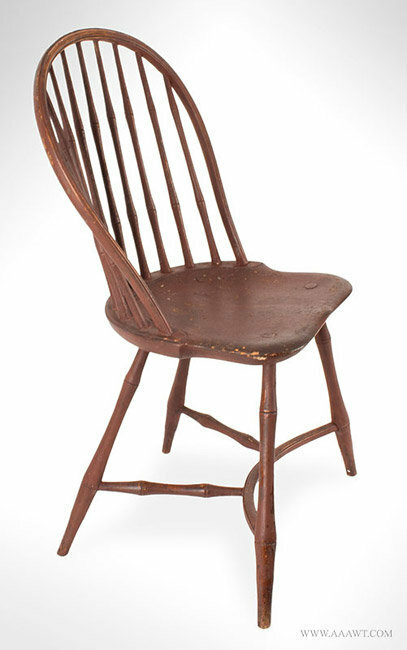 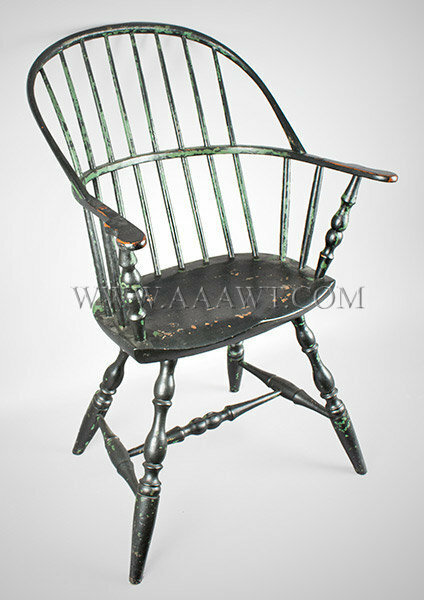 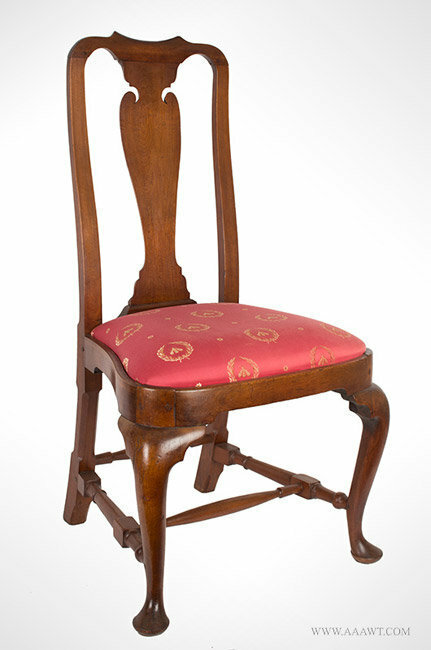 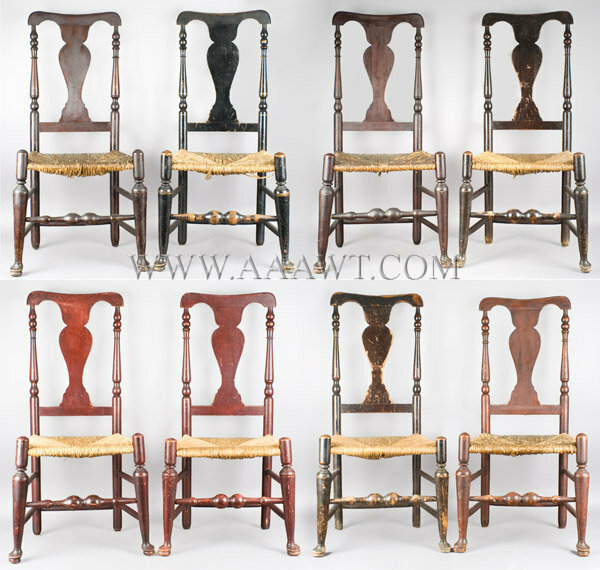 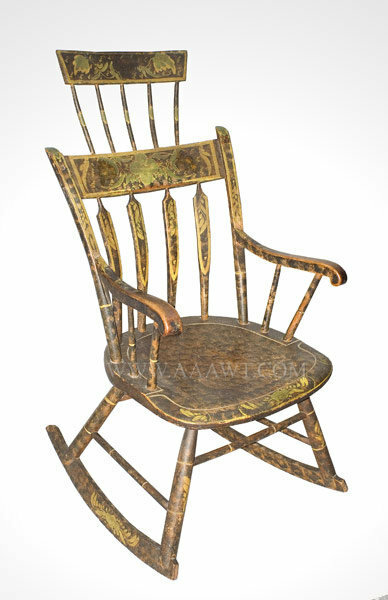 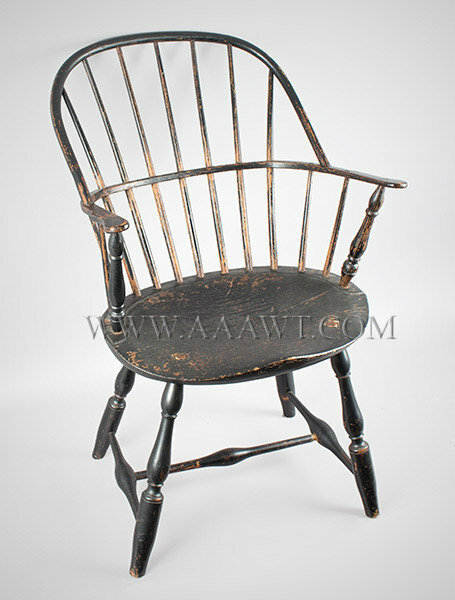 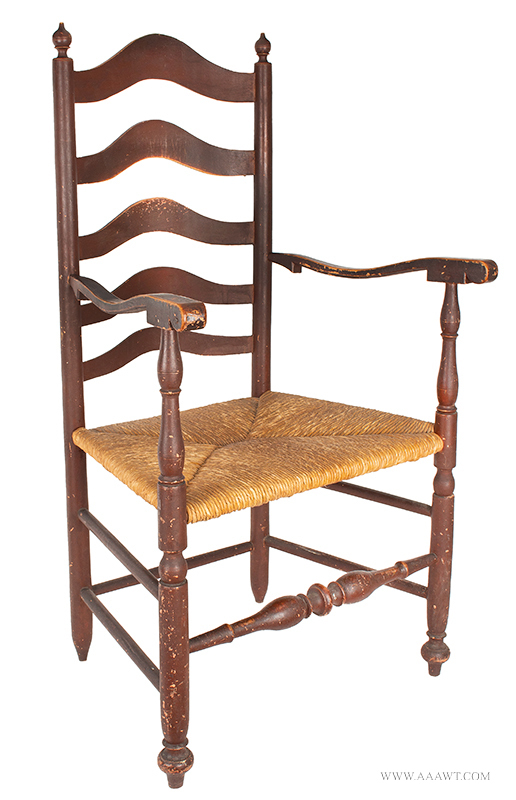 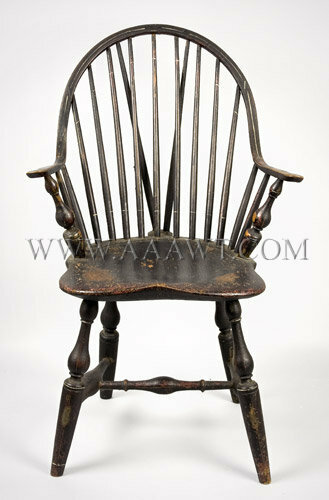 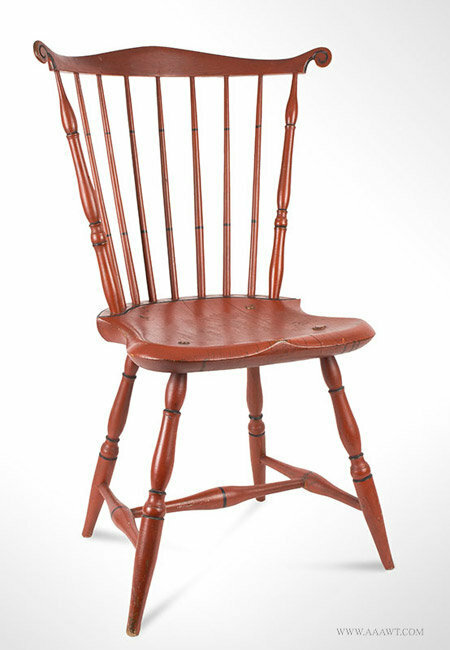 Dimensions: 49" overall H, 17" seat H, 26.25" W, 19" D.
An assembled and fine group of closely related side-chairs featuring the same vocabulary of turning; possibly made in the same shop; all following a nearly identical shop tradition. 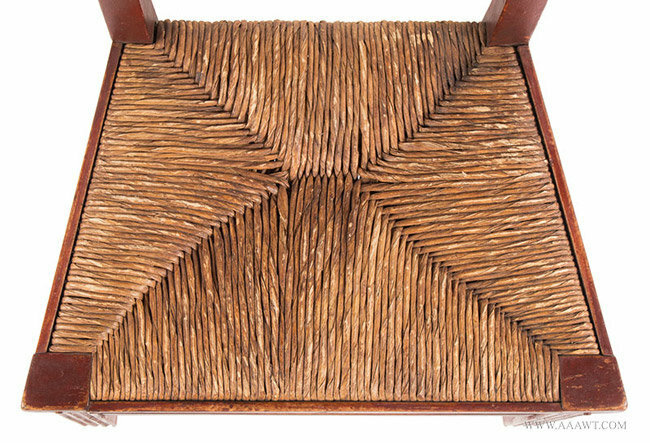 There are matched pairs and singles within the group; surfaces appear to be original; red and brown. 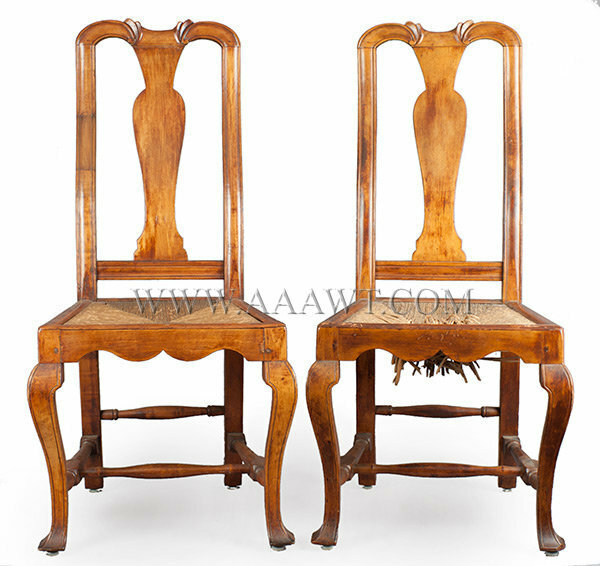 These present very well as a set and are in excellent functional and original condition. 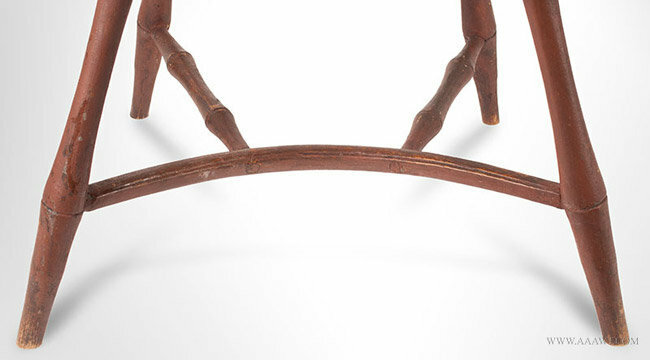 Great surfaces. 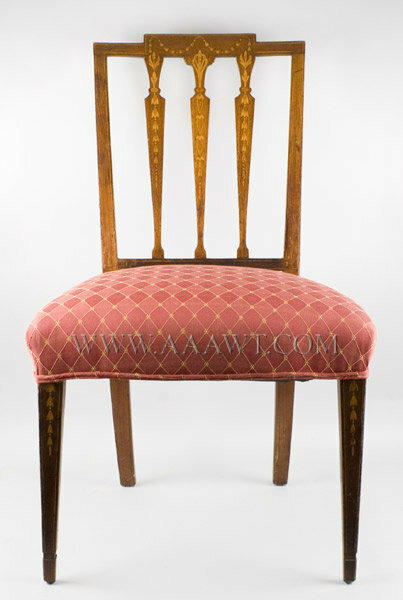 A stylish example of generous proportion featuring crisp turnings and a dry surface; the turnings picked out in gold. 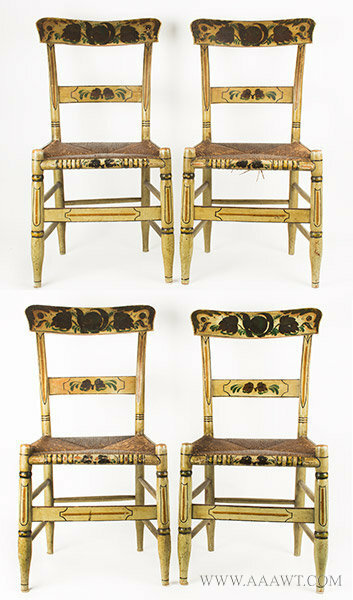 The square crests inlayed with festoons of bellflowers and pendant flowers; the stiles and rails feature sting inlay; serpentine seats on bellflower and cuff-inlaid square-tapered front legs, plain raking rear legs. 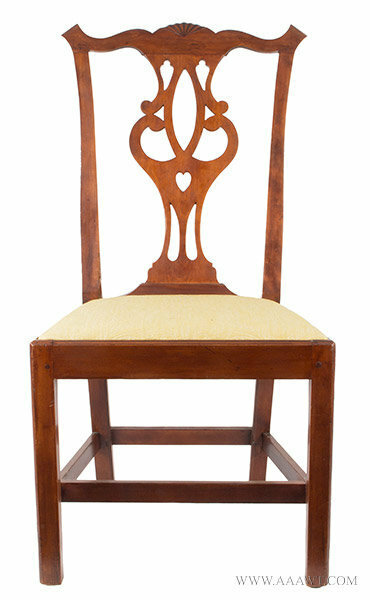 A set of six identical chairs (Cluett Collection) were exhibited at The Museum of Fine Arts, Boston; December 20, 1936. 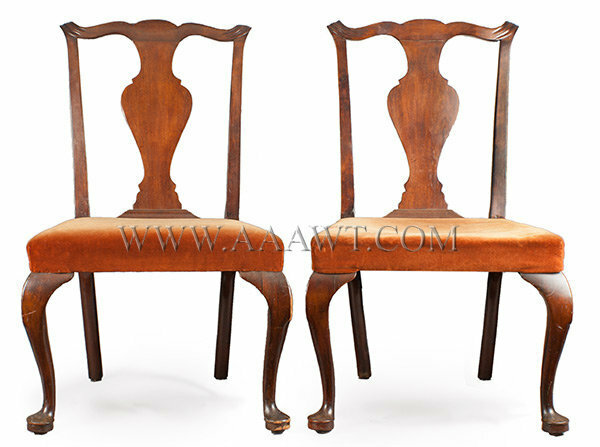 The Cluett chairs are pictured and discussed in Colonial Furniture in America by Luke Vincent Lockwood, volume II, pp. 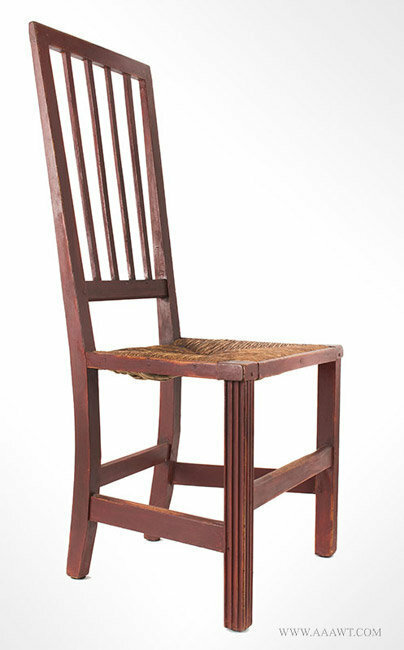 307-308. 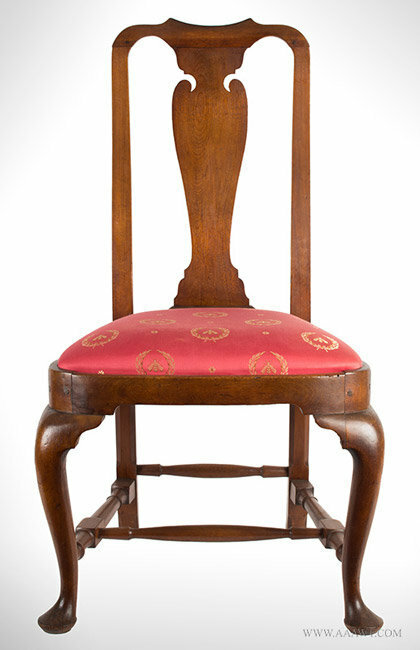 There is a professional repair to one of the legs; contact David Hillier for more information. 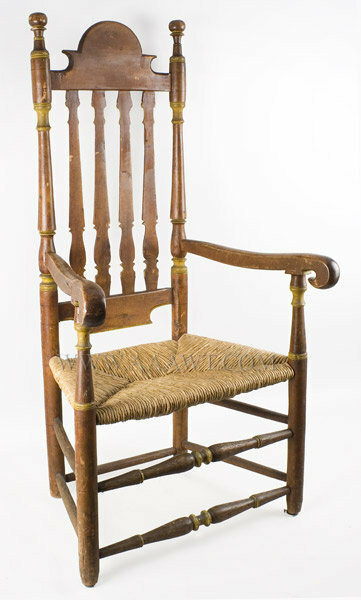 The chair displays an extremely well developed splat and flamboyant crest rail with exaggerated ears and quarter fan; the owl splat variant with heart cutout at center is related to examples from both Connecticut and Rhode Island; however the maple slip seat frame is constructed of extremely thin stock; typically a Connecticut characteristic. 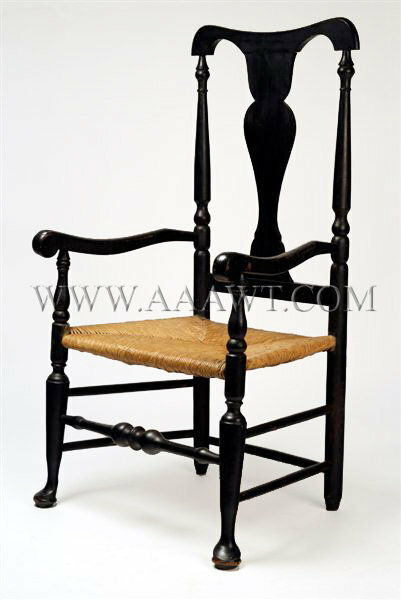 The trapezoidal seat rails are molded; the corner molded legs joined by side, center and rear stretchers; small details such as chamfering to the backs of legs, the stile shaping (rear) and other nuances are finely executed. 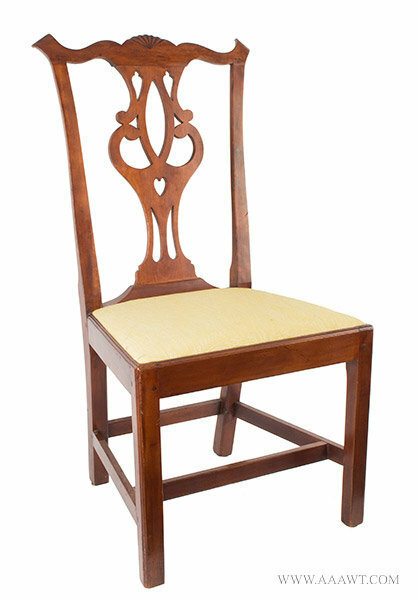 A lovely chair! 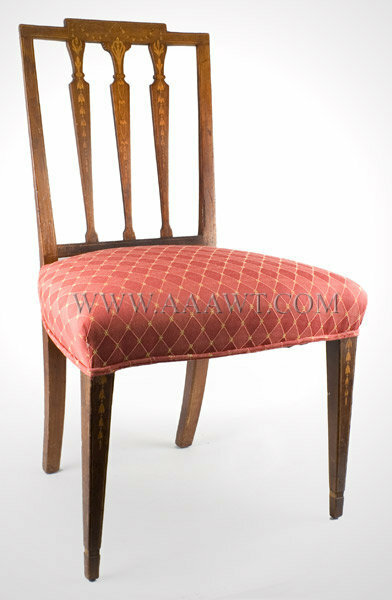 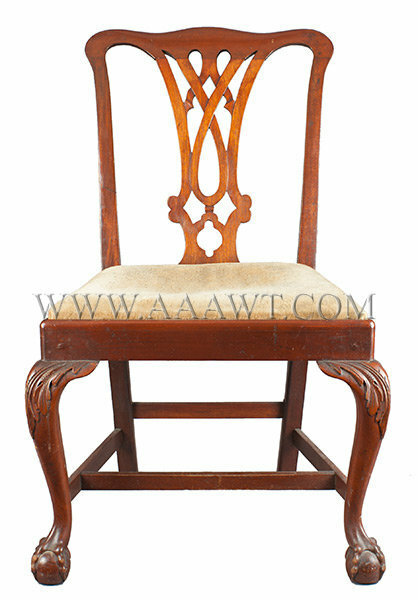 Each with bow and wheat carved paneled top rail above eagle and cornucopia carved backrest; the back rest enclosed by reeded stiles continuing to conforming saber legs. 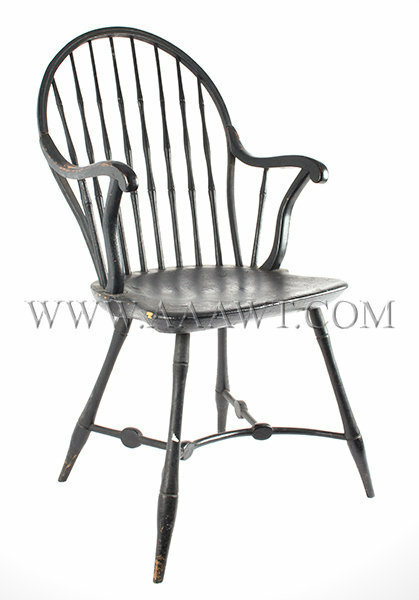 A closely related example is published in “Harbor & Home, Furniture of Southeastern Massachusetts"; Jobe, Sullivan & O’Brien, pp. 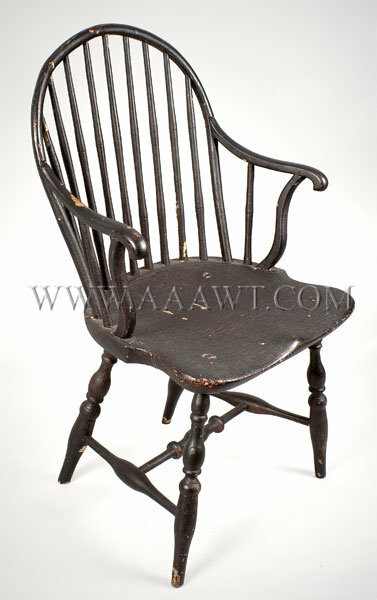 89, 90; plate 22.1 For additional information see American Windsor Chairs by Nancy Goyne Evans, The Southern Coastal Area and the Islands, page 372; see figure 6-227; the author discusses Charles Chase on pp. 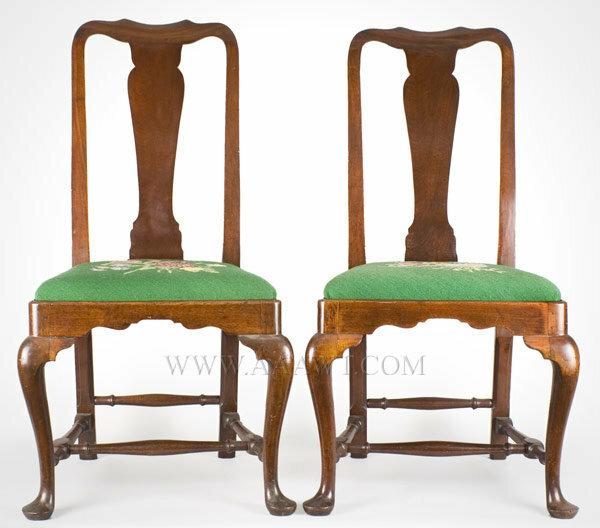 381 and 382. 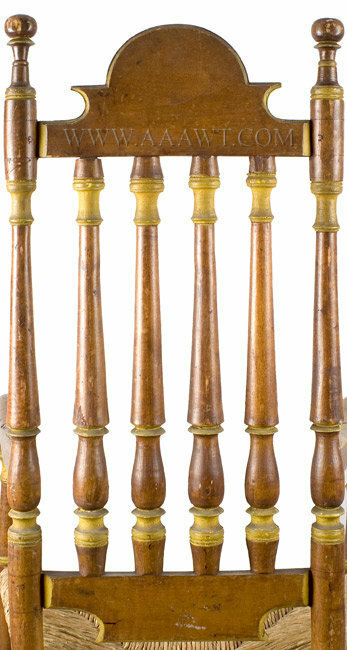 The concave (yoke) crest over five molded-slats centered by turned posts; down-sloping arms with scrolled handholds; sausage turned stretchers. 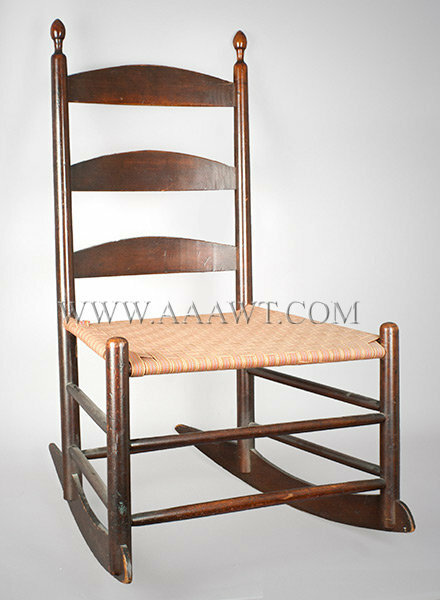 The chair lost height and was worthy of being expertly "ended-out" beneath the stretchers. 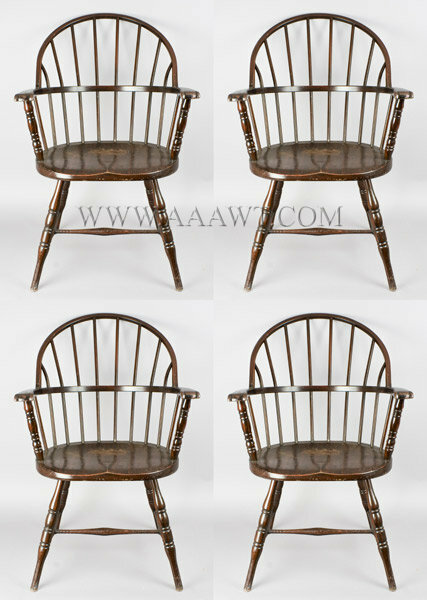 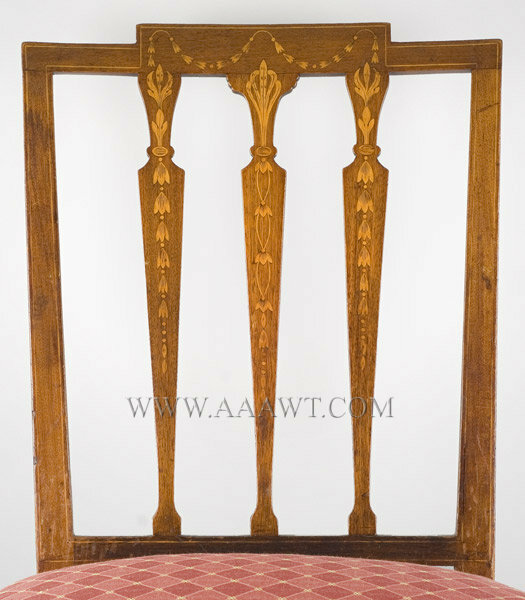 Dimensions: 49.5" H, 17" seat H, 23.75" W, 22.5" D.
See American Windsor Chairs by Nancy Goyne Evans, page 358; also The Windsor Style in America, Volumes I and II by Charles Santore, pp. 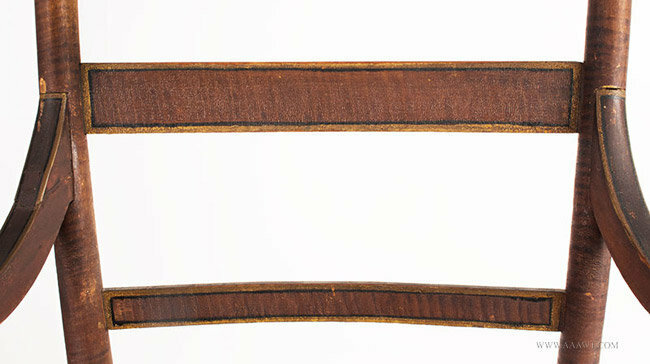 130 and 131. 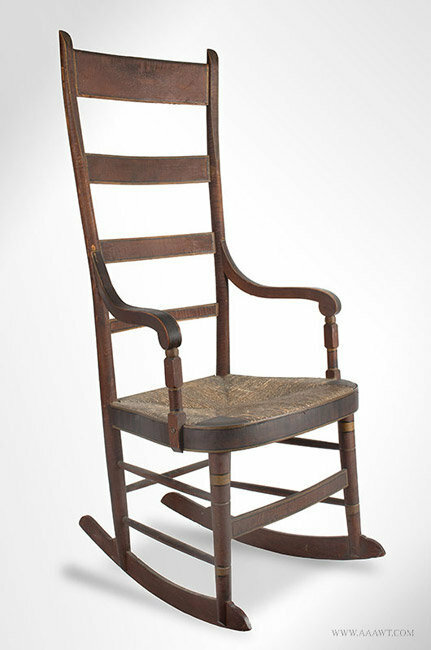 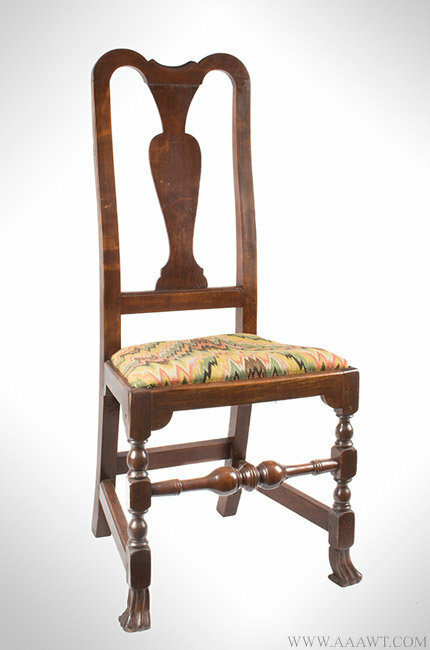 A comfortable chair displaying a rare combination of turnings that ornament the chair; the arm supports boldly follow the pattern of medial-stretcher, and the arc-front seat with a slightly projecting center point is not a common feature. 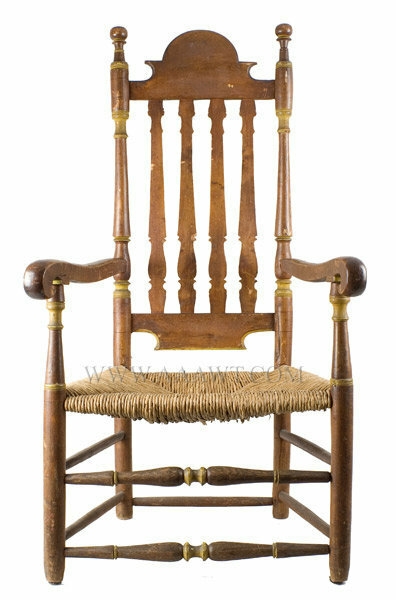 REFFERENCE: American Windsor Chairs by Nancy Goyne Evans, fig. 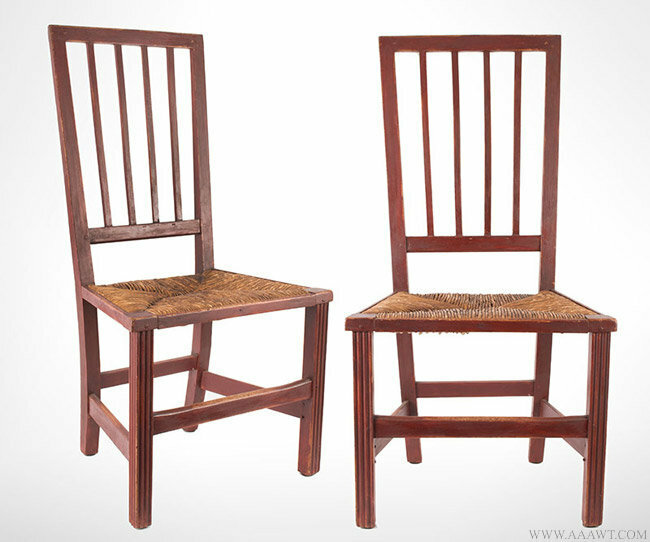 6-49 and 6-56. 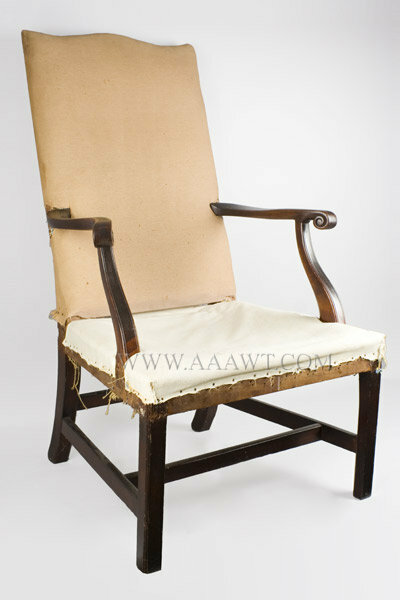 Original surface history, some thinning paint, tight condition. 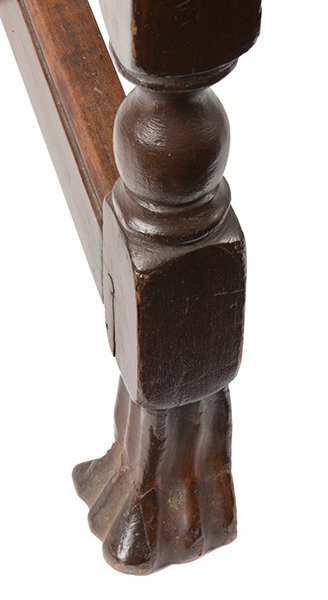 The yoke top rail above vasiform splat received by a molded shoe centered by slightly spooned stiles, the backs of which are carved, above trapezoidal slip seats set within shaped seat rails raised on cabriole legs ending in pad feet; joined by block, baluster, and ring turned stretchers. 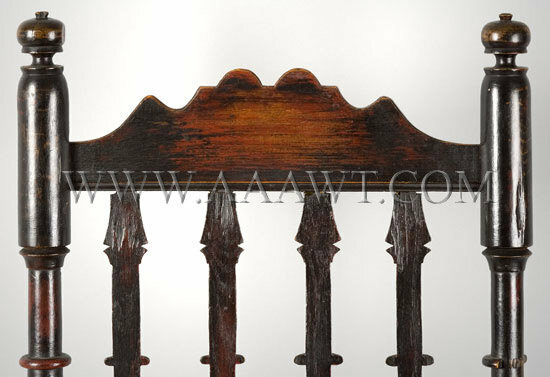 The backs of the posts are molded above the blocked section receiving side rails; beneath which are raking rear legs having chamfered edges. 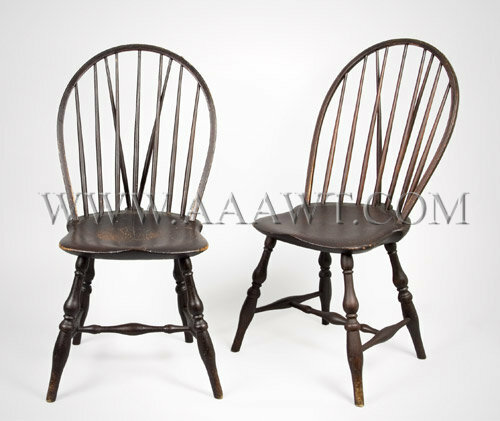 Both chairs are in overall very good condition with only minor imperfections. 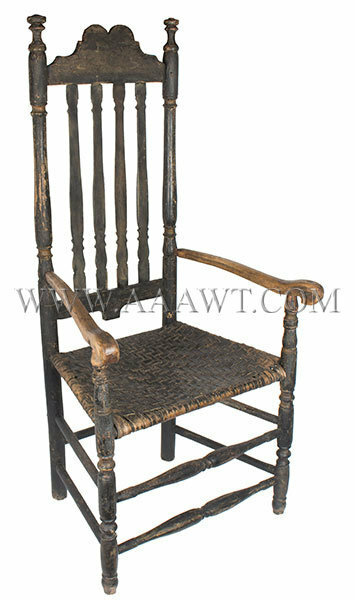 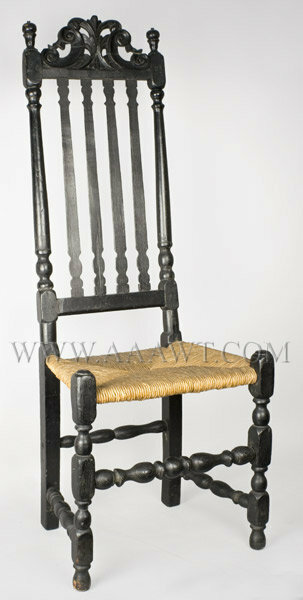 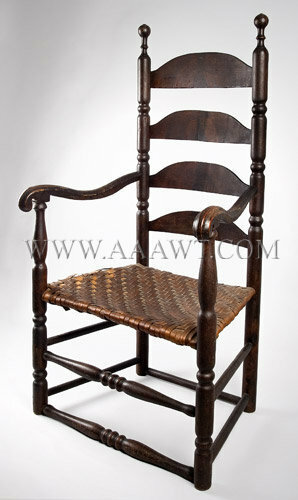 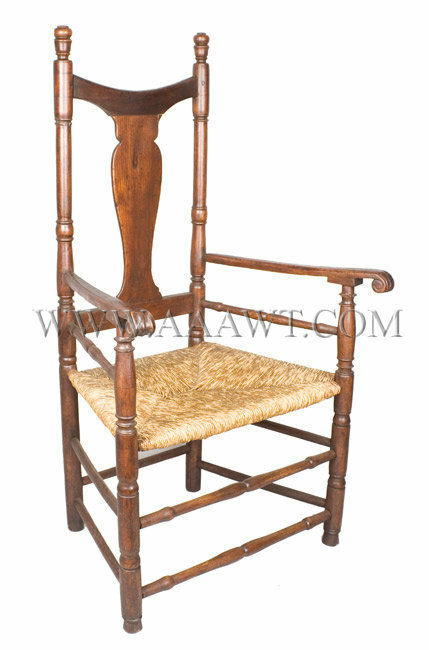 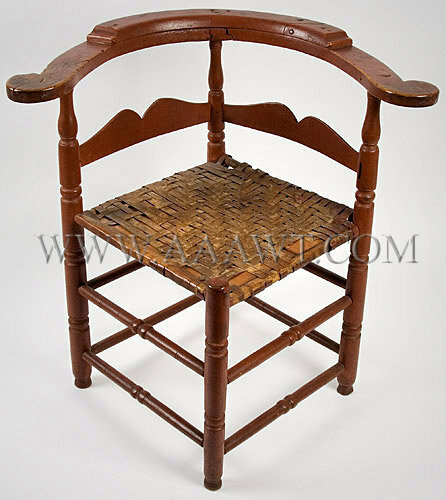 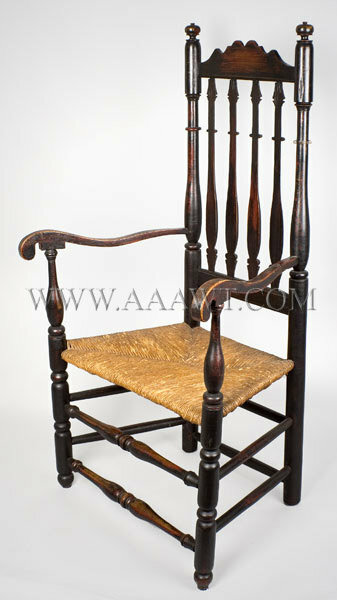 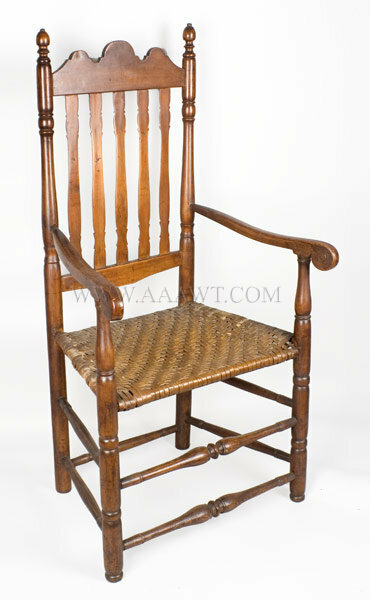 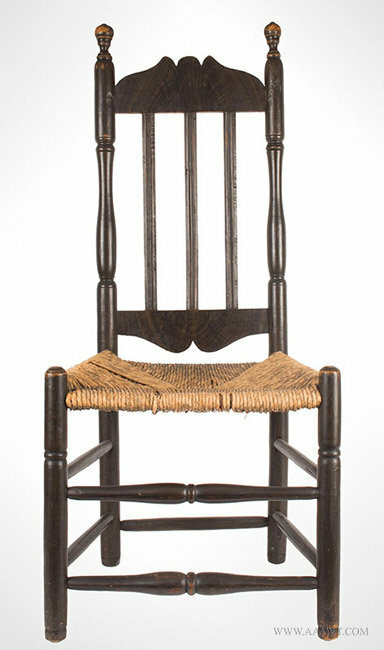 Dimensions: 40" H, 19.5" seat H, 21" W, 17" D.
This chair features a dry and ancient surface, and robust turnings. 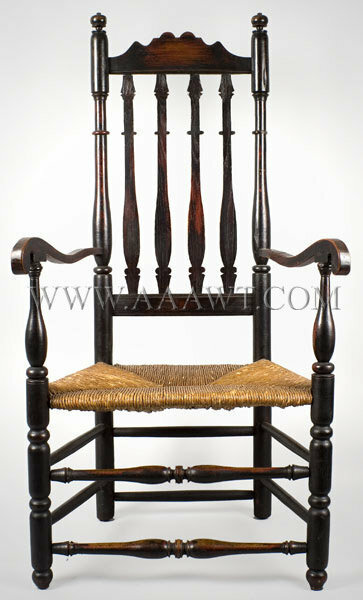 The carved Prince of Wales crest and four shaped banisters above a rush seat, raised on frontal vase-turned and blocked legs ending in ball feet; joined by a turned box stretcher. 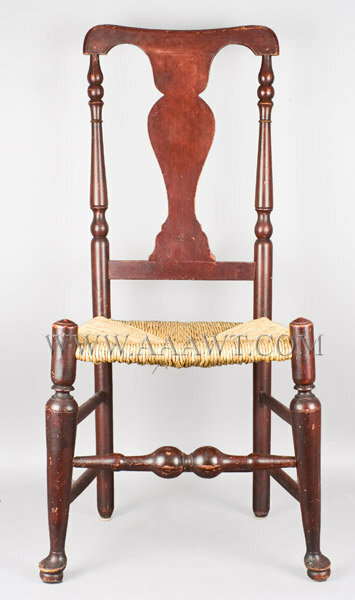 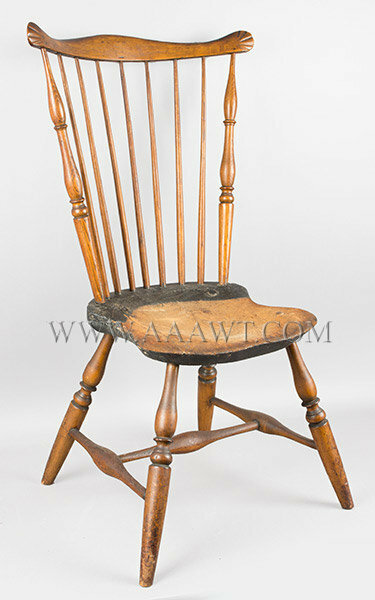 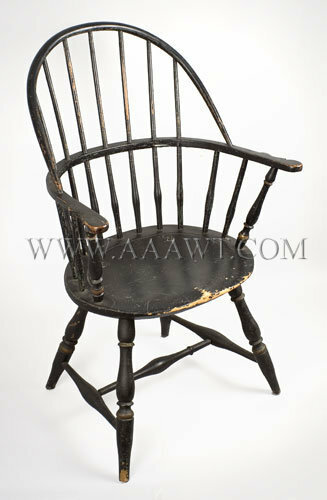 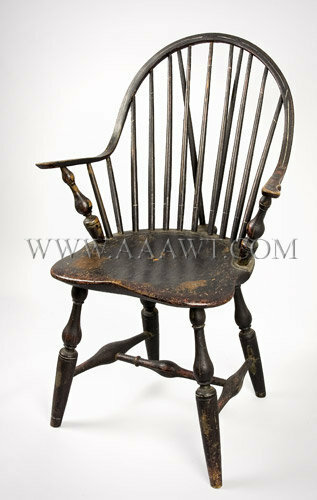 Due to fragile construction this chair, like many, it has imperfections; back legs are extended, other repairs. 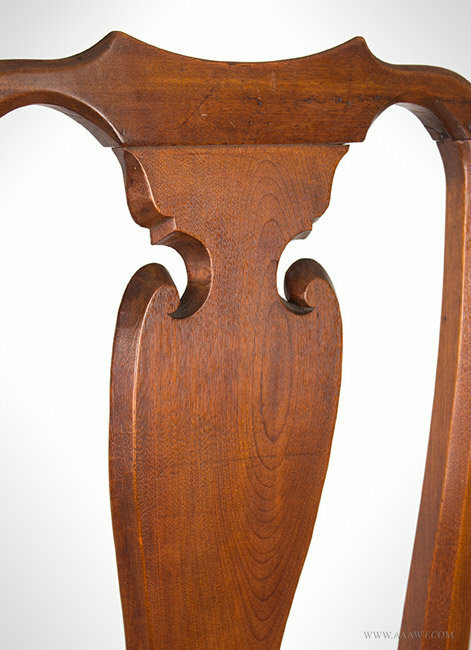 A delightful arched and saddled crest with "ears" formed by the distinctive circular shape cutouts above turned and split banisters centered by rear-posts featuring congruent profile. 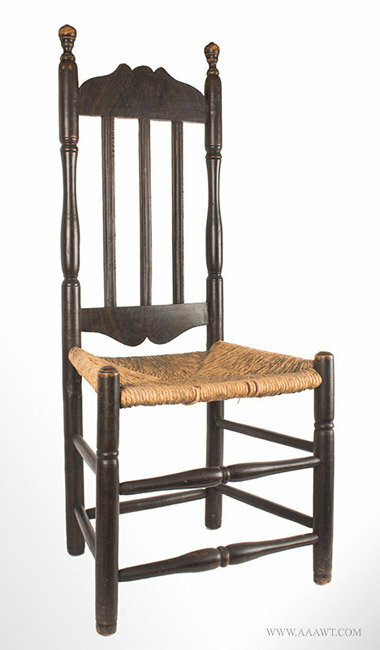 The trapezoidal seat with front corner-blocks raised on turned legs, the front turned; the legs joined by stretchers, the front with robust turnings. 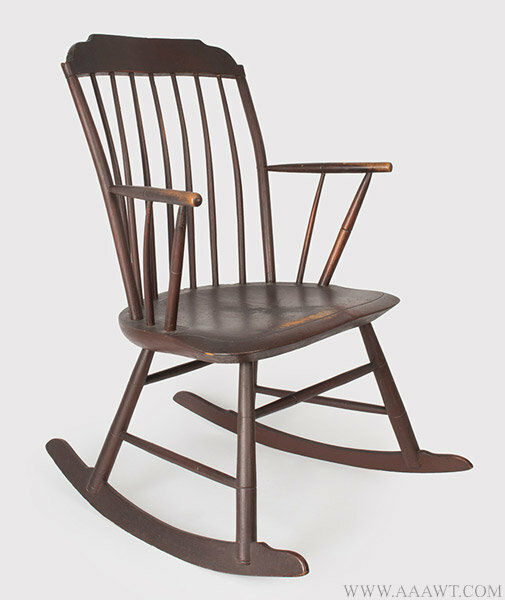 See American Furniture in Pendleton House by Christopher Monkhouse, RISDI, page 156; catalog number 96. 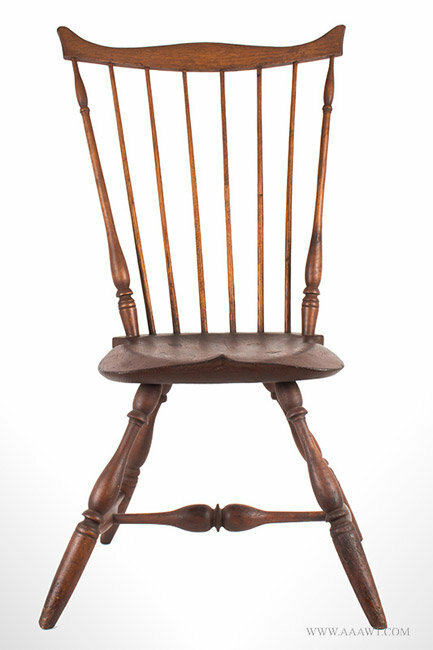 Dimensions: 40.5" H, 17" seat H, 19.5" W, 14.25" D.
The bowed back centering nine tapering spindles, receives the down-swept arms with scrolled ends, raised on shaped stiles. 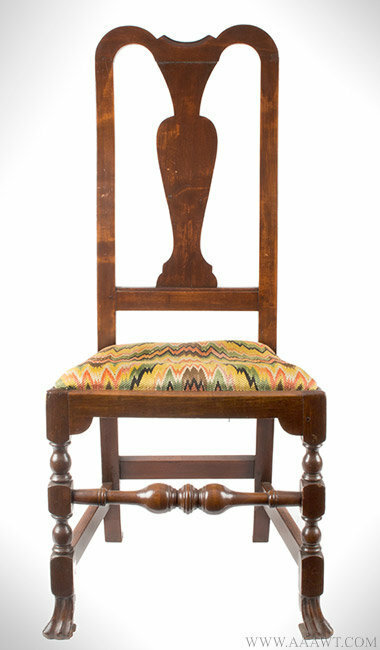 The shield shaped seat above nicely turned legs, joined by robust "H" stretcher. 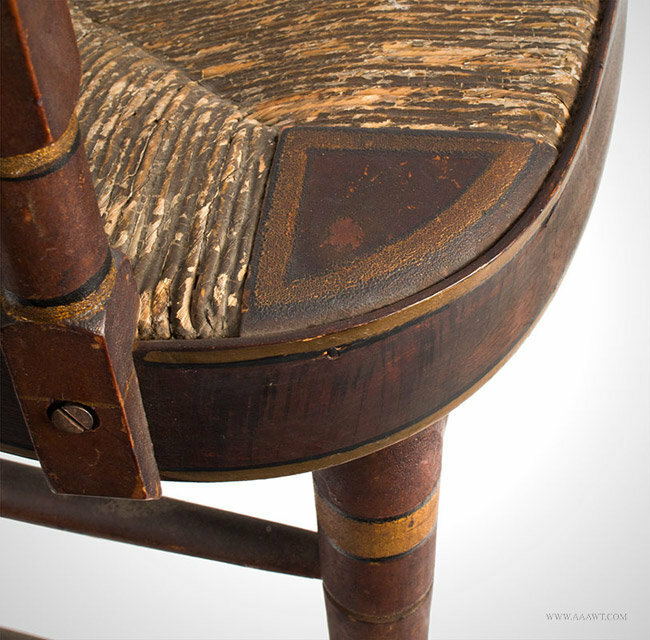 Ancient black paint over original surface history. 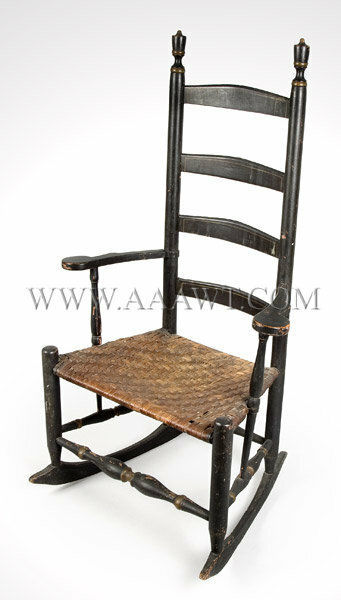 Dimensions: 38.75" H, 20.5" W, 17.5" D.
A nice example of the sometimes called nursing or work chair. 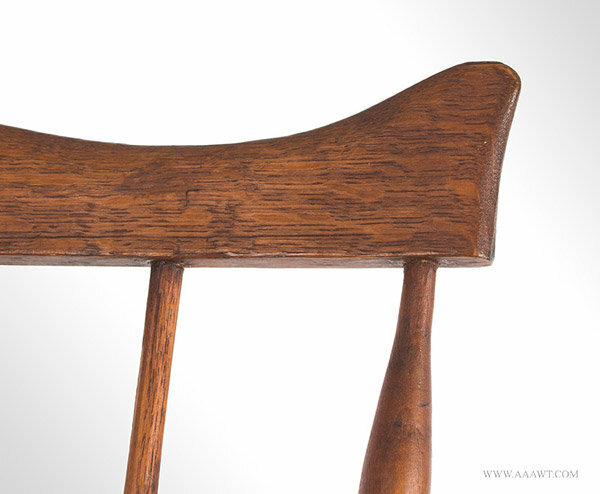 Maple and ash. 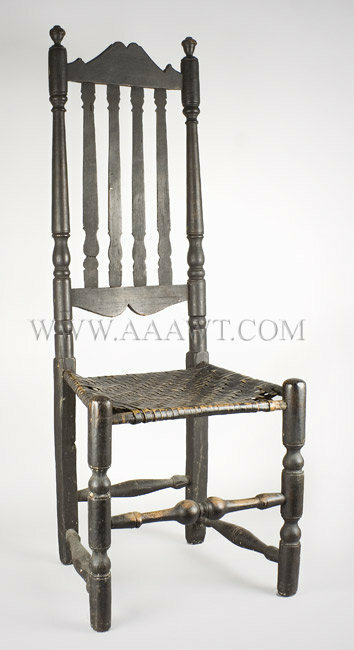 Measures 31" in height (with a seat height of 17"), 29.25" in width and 23.5" in depth. 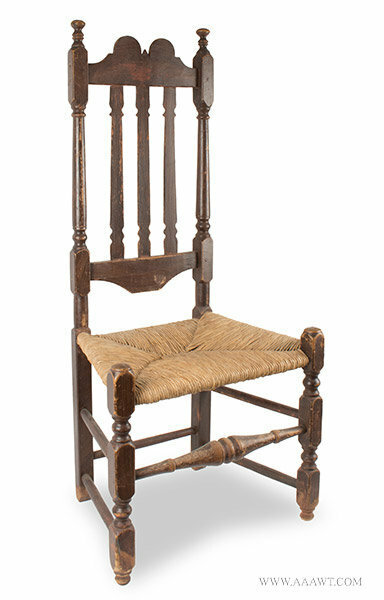 The carved pillow-crest on chamfered flat arms with out-swept handholds raised on baluster and ring turned posts joined by arched splats above the old rush seat with chamfered corner-block above the front leg with conforming turnings; the rear and side posts with tapered foot joined by double box stretcher. 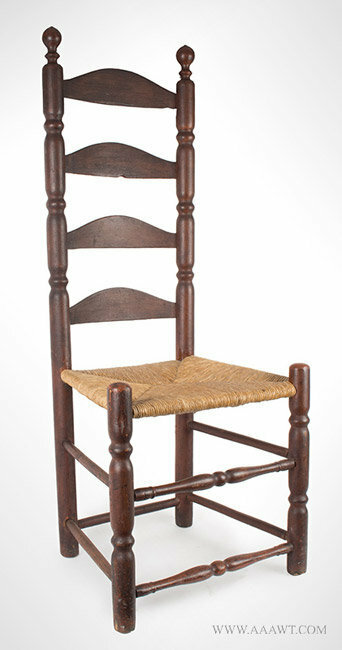 Dimensions: 31" high, 17.75" seat height. 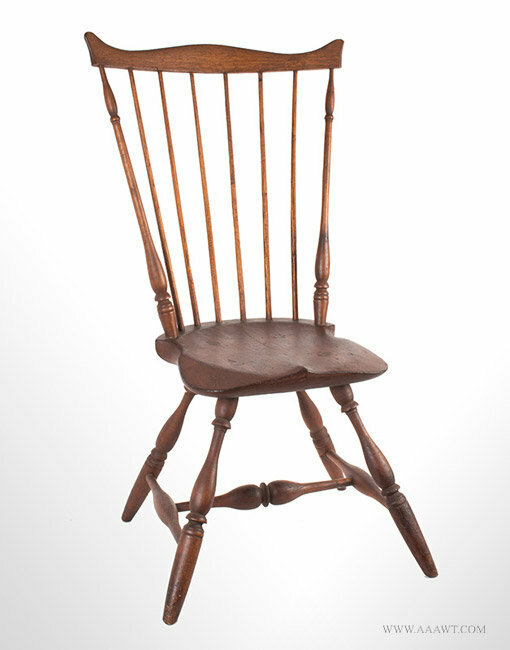 A terrific 9-spindle example with rarely encountered maker's brand remaining in fine condition. 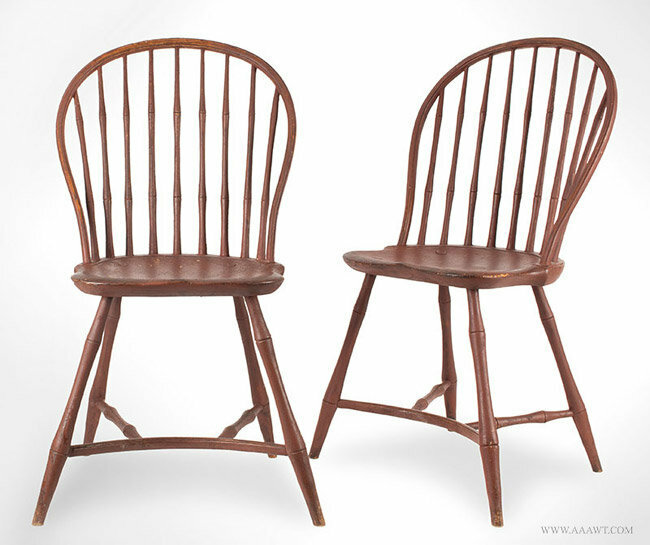 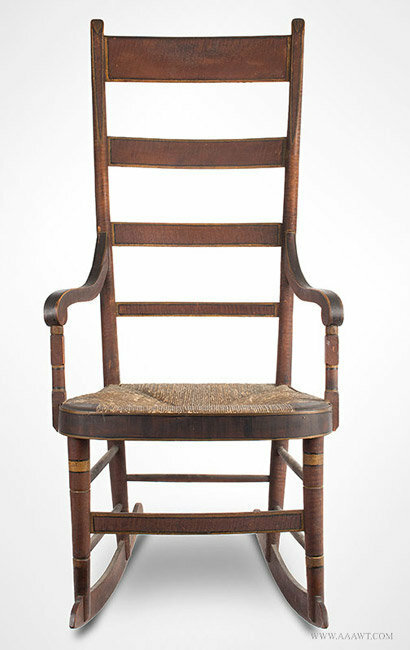 Nancy Goyne Evans publishes a nearly identical example in American Windsor Chairs. 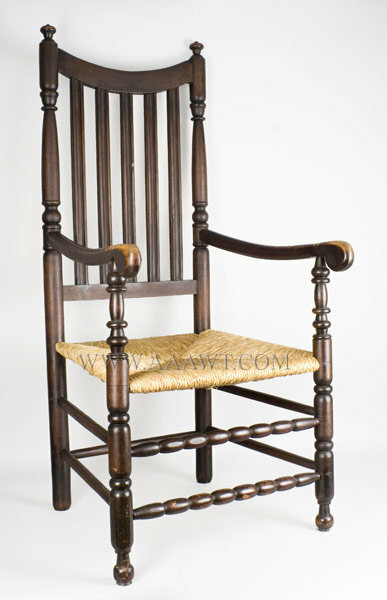 This outstanding arm chair of oversize proportion features a yoke-crest rail above turned and tapered rear posts centering a solid vasiform splat. 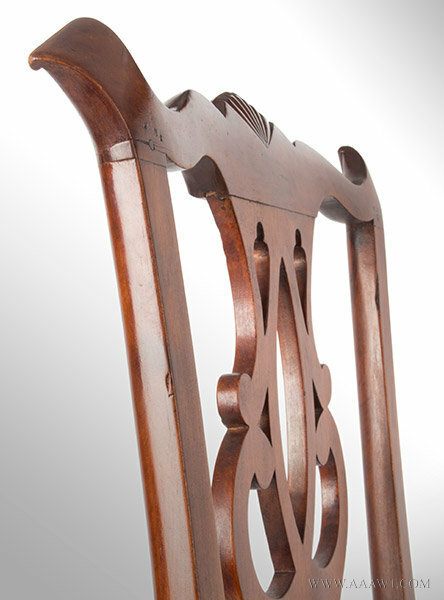 The concave arms with down turned scrolled handholds rest on beautiful ambitiously turned front posts. 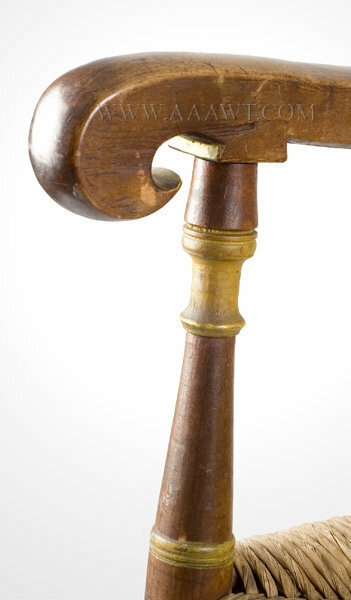 The rear posts taper forming the conical feet and are joined to the beautifully turned and tapered front legs by box stretchers...the front stretcher being boldly turned. 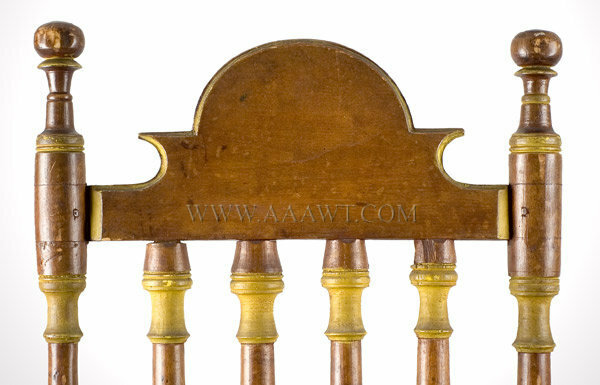 Please notice the out swept feet retain intact under pads. 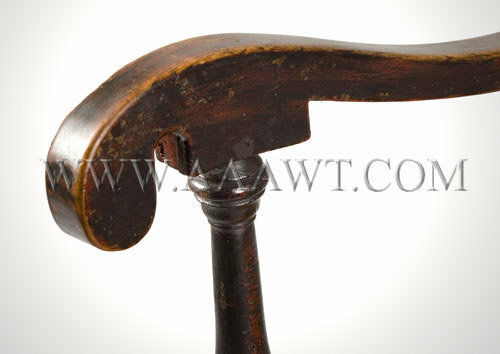 This rarely encountered example remains in excellent condition...a minor tight grain fissure on right side of splat had been repaired with all else fine. 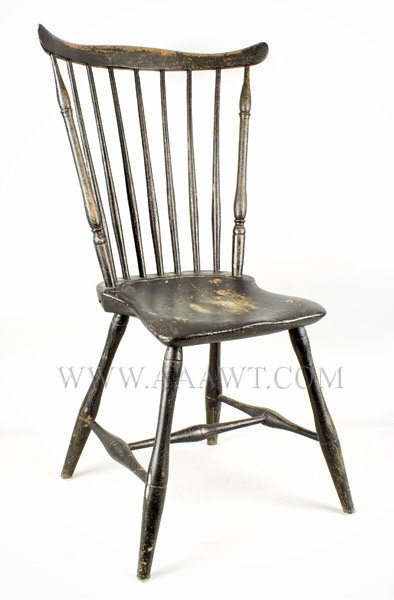 The surface appears to be 19th century black paint over original black paint. 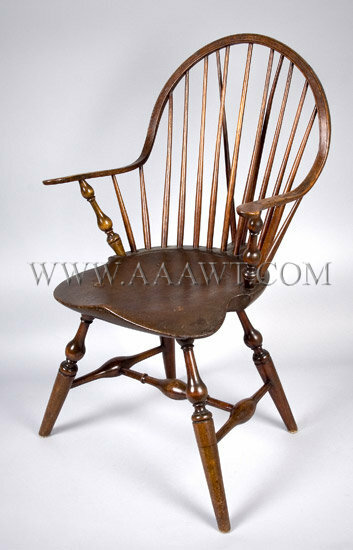 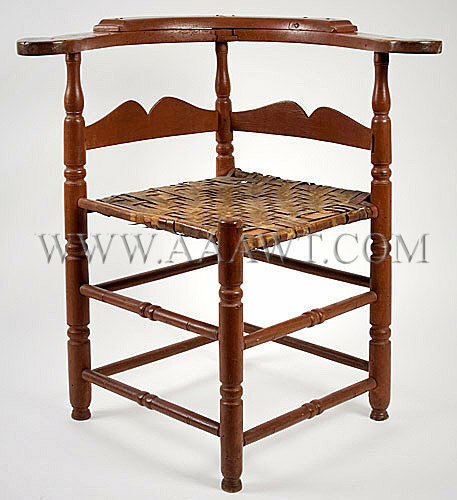 Dimensions: height: 46.5"; width measured across arms is 25.5"; depth of seat; 18".